Freshman attacker Henry Maas throws the ball during Sunday's game against Wagner. 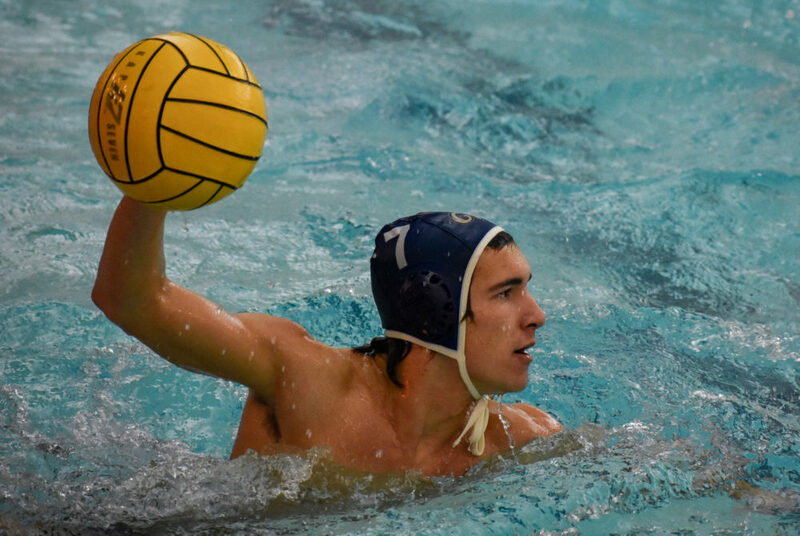 Men’s water polo went 4-1 in its last five games heading toward the end of the regular season, but head coach Barry King is still not satisfied with his team’s performance. The Colonials (17-6, 7-3 MAWPC) kicked off the season playing 17 games in September. But next month the team only saw action four times, which King said threw off the team’s momentum from earlier in the season. “We’re just not playing with the kind of pride that we played with earlier in the year and it’s just a matter of getting back to it,” King said after Sunday’s match. With two games left in their regular season, the Colonials are focused on playing unselfishly on the offensive end and getting back on the same page defensively by improving communication and execution. King said the team was in the “right place” in the pool when holding off opponents but were not executing their shot block defense and forcing the other team to take shots at bad angles. When on the attack King said the team played “great” in spurts, but then faded off and made selfish mistakes that immediately resulted in goals for the other team. With two weeks before the Mid Atlantic Water Polo Championship, the team is using this weekend to work out kinks in the pool before postseason play. Kerwin said the team needs nail down its man-down defense and improve communication in the pool. The upcoming weekend games are a slate of rematches for the Colonials, who have faced off against Johns Hopkins on the road and Navy at home earlier this year. GW has lost to teams they have beaten previously two times this season, including the Colonials’ two-goal loss to Wagner Sunday, and have allowed teams they have won against handily to play competitively the second time around. The Colonials beat Fordham on the road by seven goals, but allowed the Rams to net 13 last weekend despite the 15-13 win. While the Colonials did not have as much trouble scoring over the weekend, junior center Andrew Mavis said the team needs to hunker down on defense to pull ahead in tight contests. The team’s trip to Navy will be GW’s first road game after a six-game homestand, where GW has been competing in a shallow-deep pool at the Smith Center. At Navy the Colonials will be playing in a bigger, deeper environment which changes the dynamics of the game and how GW should approach the match, King said. Even though the Colonials will be facing off against familiar faces this weekend, Mavis said the team will not let past performances dictate their play, as the next two games are critical for seeding in the tournament. The Colonials return to action in a doubleheader Saturday. The team will face off against Johns Hopkins 10 a.m. Saturday at the Smith Center before traveling to Annapolis, Md., to take on Navy at 8 p.m.